This page will give the monthly performance data, using official valuations. More recent updates, including NAV estimates by the fund manager, may sometimes be found at What's New? The first chart shows the absolute investment performance of the Fund up to the end of March 2019. 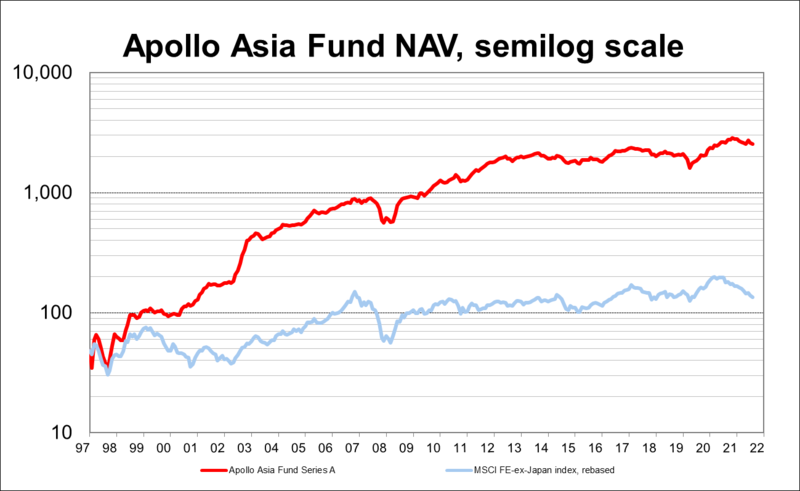 The Net Asset Value per Investor Share (Class A share) has been linked to the rebased NAV of the predecessor Apollo 001 portfolio, which had the same investment style, started at the end of 1997, and was folded into the new fund at US$100 on 30 Nov 1999. The NAV at end-March was US$2,131.54, up 0.3% for the month, and 6.2% year-to-date. It was 9.6% below the peak attained in January 2018. NAV is up 44 times over the twenty-one-plus years since inception; annual compound growth over this longer period has been 19.5%. Charting NAV on a semilog scale puts the recent performance in context: we've made very little headway in the last five years, a contrast with the previous fifteen. The market's recovery post-08 was due to unprecedented intervention by governments and unsustainable stimulus, now spent. These responses papered over and exacerbated major problems. We have been expecting renewed turmoil, and now see the unintended consequences of bubble-blowing and excessive bureaucracy unfolding in FX and commodity price volatility, market distortion and manipulation, the displacement of useful activity by enforcement and compliance, and distributive and political tensions. We have been warning for some time that the next stage may be harrowing, and are now in uncharted territory, after decades of peace, prosperity, and a prevalent international order. During the Asian crisis of 1997-98, the global economy and geopolitics were stable: now they are not. Asia used to be a leveraged play on global growth, on the exploitation of natural resource windfalls, and on the easy catch-up phases of development. Growth has slowed sharply, and the former pace no longer seems achievable or desirable. The global consensus on economic and social convergence is breaking down. Rising costs of resource extraction and environmental damage have been proving increasingly burdensome; now there is concern about ecosystem collapses which may threaten our way of life within the investment horizon of a pensioner. The earning-power of many countries and businesses is now hard to predict. Our shares at the end of March were on an estimated current-year PE of 11.8, with a net dividend yield of 4.3% after Asian taxes, and price to book of 1.7. The average return on portfolio-equity is 14.2%, at the low end of the historic range; the portfolio still contains a number of special situations. Valuation is not as attractive as in the fund's early years, but much better than for some time; the PE is now at a seven-year low. Business conditions are still tough in many sectors; we have prioritised resilience and cash generation over growth in some cases, and value and potential in others. Aggregate portfolio earnings, dividends and book value have all been growing, but our long-term growth expectations for Asian economies are much lower than in the past, the challenges facing companies are greater, and absolute risks remain high. However, valuations seem reasonable in relation to the rising-but-still low interest rates available on deposit, and the risks to bank creditors. Diversification seems prudent; the opportunity set is nothing like as attractive as it was in the early years. When considering valuations, it should be borne in mind that, although we would never wish to be limited to a small-cap universe, many of our companies are small, illiquid, or both. A discount for these is appropriate: for small companies because of concentrated risks (a corollary of focus and concentrated rewards) and the dependence on key individuals (big companies have greater momentum); and for illiquidity, not because we intend to trade, but because it greatly increases the costs when we have to do so. On the other hand we tend to calculate EPS on recurrent earnings and full dilution, erring far to the side of conservatism, whereas figures reported under new accounting standards often seem to us overstated. 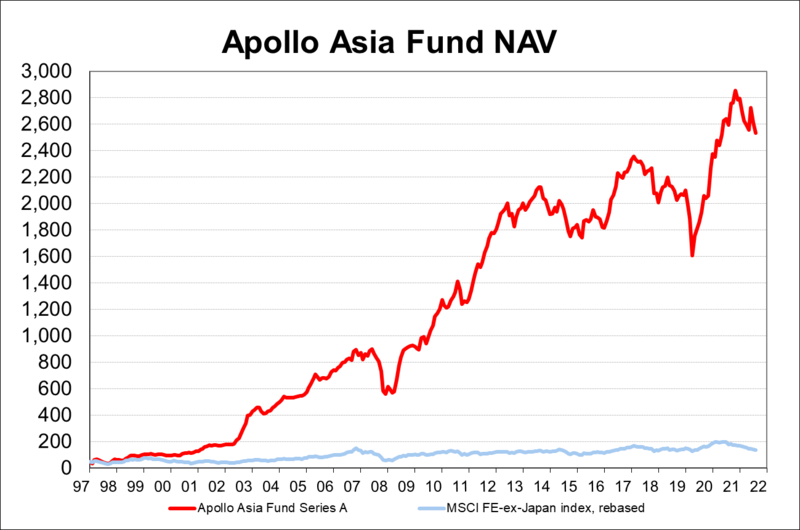 Net asset value of the Apollo Asia Fund is calculated after fees and the 15% incentive allocation. No management fees were charged against NAV of the 1997-1999 portfolio. The Fund is managed for absolute returns, and not by reference to an index or peer group. The Fund typically has a concentrated portfolio of shares selected on a bottom-up basis, and the geographical mix has changed considerably over time. We show an index just to give some idea of broad stockmarket direction in the region, since this usually explains most of the volatility from month to month, even though our portfolio mix may be very different. The index unfortunately excludes dividends, a major factor in long term returns. 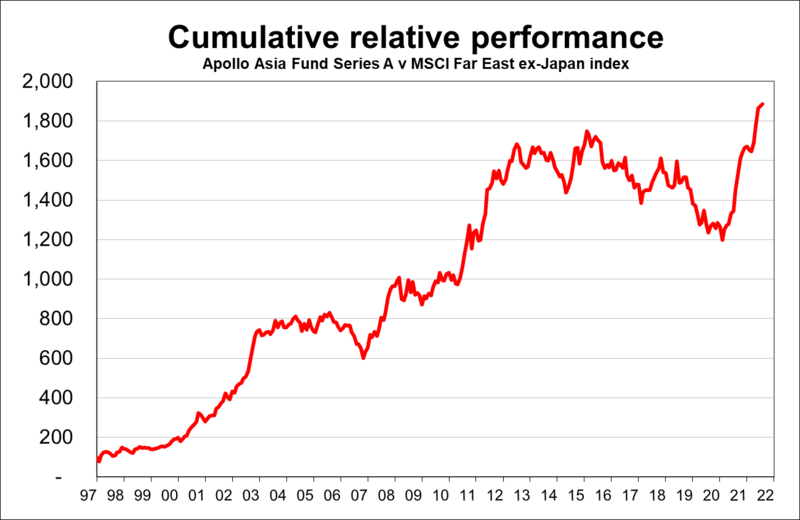 The index we have used is the MSCI all-country Far East ex-Japan index, a fairly broadly-based index denominated in US$ but comprising mainly large-cap stocks. From Nov 2001 we were forced to change to the 'free' index, which weights stocks according to estimated free float, rather than the index weighted by market capitalisation which we used earlier, and which MSCI discontinued. The two tracked each other fairly closely during 2001, and indeed since inception in the mid-80's, so we chained the two series at the end of October 2001. The second chart shows the relative performance of the Fund against the regional index. During the Fund's first twenty one years, the index had eight down-years and thirteen up-years; the Fund had six down and fifteen up. Historically, the fund has underperformed in the late stages of bull markets, but declined in absolute terms in the folowing bear. Depressed or chaotic markets have historically provided us with more attractive choices, which contributed to later outperformance. However there is no certainty that comparable opportunities will continue to arise, or that our winners will continue to outpace the losers. The raw data is on a separate page: monthly NAV figures. Shareholders taxable in the UK will find reportable income for years starting 2013 linked from this page: UK Reporting Fund Status.